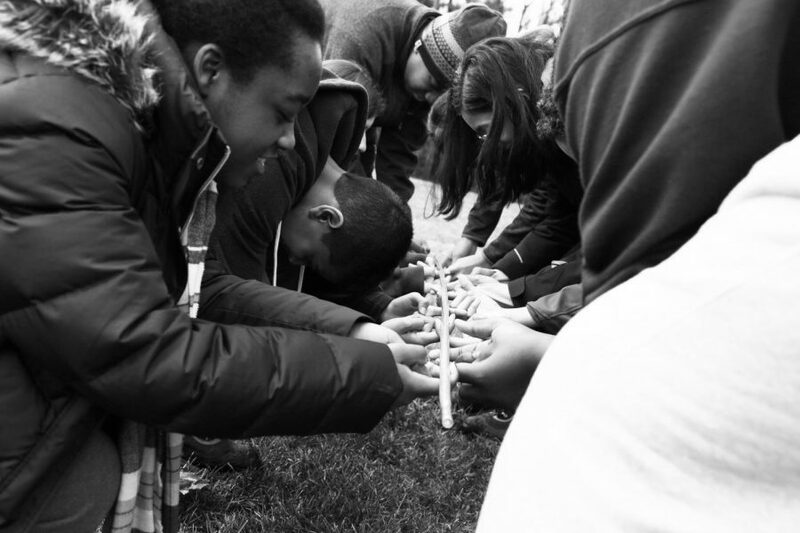 Building Bridges: Eighth graders participate in team building activities. The week long eighth grade program kicked off a few weeks ago, with the second group having just recently returned. The program is off to a great start without any problems, Head of the Middle Division Robin Ingram said. The John Dorr Laboratory, which is located in Connecticut, is used for a variety of programs for all divisions. John Dorr, the namesake of the campus and a neighbor of the school’s headmaster at the time, Dr. Mitchell Gratwick, donated 85 acres of land to the school in 1965. “The school felt that there were other dimensions to education that they wanted to deal with outside of the traditional classroom setting,” Director of John Dorr Nature Laboratory Glenn Sherratt said. The following year, Gratwick started the eighth grade program, which was originally 11 days long and designed to teach the young men of the all-male school at the time valuable community and leadership skills through service work and humility in the outdoors, Sherratt said. The intent of the program has stayed the same over the years but the specific activities have changed, Sherratt said. Some of the current activities include climbing the Cooperative Adventure Tower (CAT), embarking on a three day backpacking trip, and hiking at night using only a compass and a map. According to Ingram, when she first started at the school, the students’ groups were determined by classes – one year it would be by math class, the next, foreign language. The school eventually changed this because classes already had a “character of its own,” Ingram said. “Doing it now as random groups gives students the opportunity to form a sense of community,” she said. According to Sherratt, the weather does not affect the program much. Most of the time when the weather gets in the way, the activities are simply shortened and less time is spent outside, Sherratt said. In extreme cases of cold weather or rain and snow, activities are canceled, but they are made up another day. The three day hike and camping trip is sometimes converted into a day hike, he said. Marina Kazarian (9), who went in February of last year, did not go on the three day hike because it was very cold, and was glad for that, she said. Jhanae Ottey’s (8) group, the first Dorr group this year, was rained out one day, postponing the compass and map activity to the following day, Ottey said. If it hadn’t been for the strong winds, the group would’ve gone outside in the pouring rain to do the activity, Offit said. Ottey thought that Dorr was an amazing experience that taught her useful outdoor skills like using a compass and how to hike, she said. “I liked how we were always on edge and didn’t know what was going to happen next,” she said. John Mauro (9) also had the opportunity to meet new people and strengthen bonds with existing friends, he said. He liked all the team building exercises but thought “it was more fun than it was a learning experience,” he said. Alison Isko (9) thought that Dorr was “was a good idea in theory, but couldn’t be a bonding experience,” as none of the people in her group were in her classes, she said. “The multiple speeches about metaphors, including one about a key necklace which unlocked our ‘frame of mind’ were rather pointless,” Isko said. Mekhala Mantravadi (8) has not gone to Dorr yet, but is excited and scared for it at the same time, she said. “I heard that there’s a lot of bonding which seems exciting, but since you’re in a group with random kids, it’ll be hard to get to know one another,” she said. After students return to school, they spend the following week catching up on what they missed by spending their gym period each day with one of their teachers. A week’s worth of material is condensed into a 45 minute session and students do not have to make up any assessments given in their classes while they were away, Ingram said. “Making up assessments added a lot of unnecessary stress, so we took them away,” Ingram said. Science teacher Donnett Bryan takes what she thinks are “the most essential points” and teaches them to students, she said. Because labs and other assessments take up a lot of time and the students do not have to do them, 45 minutes is enough to cover the raw material, she said. “I think the Dorr program is a great experience and shouldn’t be compromised in any way, and so I try to be very accommodating to my students,” Bryan said. “For my classes, a lot of the material covered on tests is important,” French teacher Kenneth Carpenter said. Because of this, he teaches the returning students as if they are going to take the test. When Carpenter was teaching both Spanish and French several years ago, it was hard to fit everything in, having to spend only one half of the period on each class, he said. For the past two years, he has also taught during D and E periods, when makeup sessions usually occur. Because of this, he had to schedule different times to meet with his students, a sometimes difficult thing to do, he said. “However, sessions are intense because they’re usually one-on-one,” Carpenter said. For English teacher Morgan Yarosh, Dorr makeup is “very kid- dependent,” she said. “The kids must learn to manage their time very well accept that they might have classes where they don’t fully understand everything that’s being talked about,” Yarosh said. Catching up on the material was not hard, but doing homework was, Ottey said. “We had to finish homework assigned when we were gone as well as current homework, so I had to stay after school a lot to finish things,” she said.